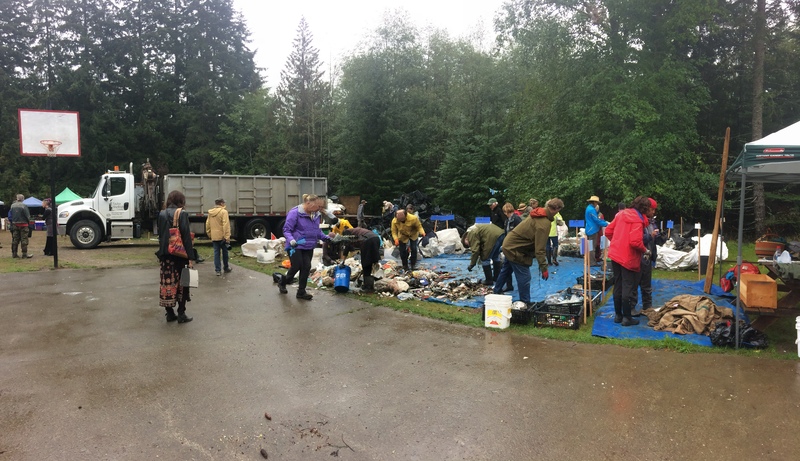 Meanwhile, community members dove in to tackle sorting out the pile into different materials that could be sent to be recycled or reused; they’ve seen this same pile for over 14 years running. Nearly six tonnes of debris was collected over the past week from the shores of Denman Island, one of the Northern Gulf Islands within the Strait of Georgia. This annual shoreline clean-up event is organized by the Association of Denman Island Marine Stewards (ADIMS). The main source of all this debris is shellfish farming equipment, including plastic growing trays, netting, fencing, floats, and rope. Shellfish farming is a valuable industry in BC, generating $53.3 million of revenue in 2016, and Baynes Sound holds approximately half of BC’s shellfish farm leases within only a 20km stretch of coastal waters. In this area, which is so critical to the province’s shellfish farming, it is crucial that commercial activities allow the ecosystem to continue supporting this high productivity, which also includes an abundance of other important marine life. …the licence holder shall not introduce or cause or allow the introduction of aquaculture refuse (including but not limited to infrastructure, equipment and materials) into the environment in the course of conducting aquaculture activities. One look around the Denman Island shoreline debris piles tells you that clearly, equipment and materials are regularly lost to the marine environment, even if unintentionally. Shellfish grown in Baynes Sound are raised in plastic trays tied to floats. Storms, strong winds and currents, and wear and tear from farming activities can cause these trays and other equipment to be lost to the sea. There are no requirements for farms to label or identify their equipment, making any enforcement of the licence conditions for debris next to impossible once gear is loose in the ocean. The clean-up of the shores of Baynes Sound has been a collaborative effort in the past two years, organized by the Association of Denman Island Stewards in partnership with Fisheries and Oceans Canada (DFO) and the BC Shellfish Growers Association. In fact, equipment sorted from the clean-up that is still useable is picked up by shellfish growers to reuse. This cooperation between the government, industry and community groups has been heartening to see, but there is much work to be done to reduce the problem before it washes up on the shorelines. Reducing lost gear from the source must involve more oversight on farming infrastructure. Last year, over 50% of licenced aquaculture sites in BC were found to have derelict or unmaintained gear and infrastructure, as well as improperly wrapped or exposed Styrofoam – which can release small particles that harm marine ecosystems. Fisheries and Oceans Canada has launched a BC Shellfish Aquaculture Debris Strategy and Action Plan to develop initiatives to limit debris from aquaculture activities and sites. Recommendations include conducting further inspections of aquaculture facilities with a focus on debris, and encouraging growers to choose materials less likely to become debris. At the G7 Summit in June, the leaders of the G7 agreed upon the Charlevoix Blueprint for Healthy Oceans, Seas and Resilient Communities, which included a Plastics Charter, signed by five nations and the EU. However, this charter is a non-binding, voluntary agreement that doesn't address single-use plastics. We need strategies to address plastics pollution that are backed up by law. Building on this Blueprint, Canada hosted a meeting of G7 Environment, Energy and Oceans Ministers in September to discuss resilient coasts and fisheries, and plastic pollution, among other themes. At this conference, Minister of Environment and Climate Change Catherine McKenna and Minister of Fisheries and Oceans Jonathan Wilkinson signed onto the Global Ghost Gear Initiative, a global alliance of nations, companies and environment groups working to address fishing and fishing-related equipment that has been abandoned, lost or discarded. Minister Wilkinson says some key focus areas of the Ghost Gear Initiative will be tagging all fishing gear so it can be traced back to its origins, as well as establishing systems to report lost gear. These actions are key to addressing pollution of plastic debris in the ocean (abandoned, lost or discarded fishing gear makes up around 10% of all marine litter). Unfortunately, aquaculture equipment is not a primary focus of this initiative. And while Canada focuses attention on this international campaign, the plastic-covered shorelines of Baynes Sound highlight that we also need to address accumulations of debris occurring at a local level. In May, West Coast joined participants from federal, Indigenous, provincial and municipal governments, as well as industry representatives and community members at the Baynes Sound/Lambert Channel Marine Ecosystem Forum to open a dialogue about challenges this marine ecosystem is facing, and to inform potential solutions. Marine debris was a key theme at this Forum. Participants discussed the sources contributing to marine plastic pollution in Baynes Sound, which present challenges for those working within, living around, and managing the Baynes Sound area. Everyone involved has a connection to this issue through the production and use of plastic, and proposed potential actions to address and reduce the introduction of debris into the environment. Collaborative initiatives like these developing within Baynes Sound between governments, communities and industry are critical in understanding issues and identifying where each group can contribute to solving the problem. Locally-focused actions can go a long way – from changing practices and materials used in shellfish farming, to enforcement of regulations, to beach clean-ups and data collection.